As the spring unfolds with longer days and milder temperatures, we remember what has passed. 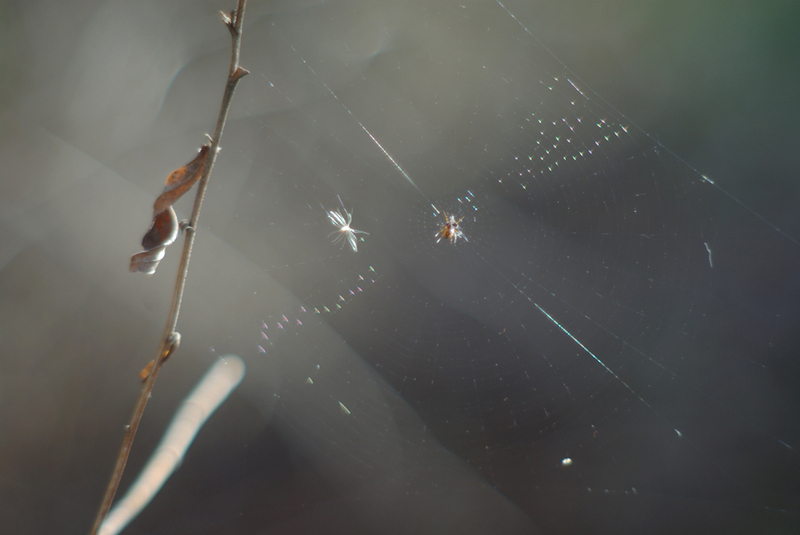 It was the tiny spider in the delicate, worn web that inspired this slideshow from 2009 and poem from 2011. Each year I leave the plants in my garden standing for the birds, insects and other residents of my garden to use for winter accommodations. In spring of 2009 I began preparing the garden section by section and happened to see this spider and her delicate web outlined in the spring sunshine. She had died long before but continued to cling there all winter long, and her web held up against any number of storms. Her eggs would have been laid on the stem adjacent to her web which would catch the first insects in spring, and when they hatched the little spiders could have their first meal of the insects caught in the web and use her web as a launching pad. 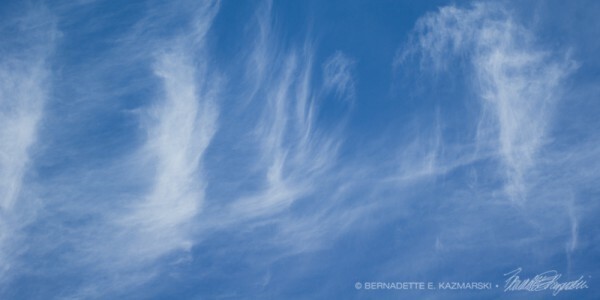 I found it so moving that on that bright early March afternoon I went through my garden looking for other such images. All the other native plants had left behind their skeletons, and the effect of these was haunting, like finding a ghost town or an unknown world. I had to let them say their last goodbye. I photographed each desolate construction with attention to extreme details you might never notice to show the intrinsic, transient beauty of these empty shells. The sepia tones are the natural coloring of the plants in the stark spring sunlight, that interim color palette between the blues of winter and the greens of spring. Below is a link to a slideshow I composed and posted on my website; when you view it, you’ll see that many of the plats I’ve photographed are criss-crossed with tattered little webs. and to come, again, in spring. Read more poetry here on Today or visit my poetry page to see more about my poetry and other writing, and to purchase Paths I Have Walked. And click here to bring up the slideshow of the images I took this day. “Paths I Have Walked”, collected poems from poetry readings. People who attended one or more of my poetry readings encouraged me to publish some of my poetry in a book from the beginning. Once I completed my 2010 poetry reading, my fourth featuring the final piece of artwork in the “Art of the Watershed” series, I decided it was time to publish something and it should be those four poetry readings. Poetry books are not best-sellers; it’s difficult to convince a publisher to risk effort on a beginning poet, and while self-publishing is the best option it’s not inexpensive and once you’ve got the book, someone’s got to market it. Plus, I’m a graphic designer and I designed books for years, and I want things my way. All of this is a recipe for a little bit of trouble, but I decided the book was well worth the effort so I designed the book myself and had a set printed—no ISBN or anything formal, but it’s a start! I’m really excited to offer it. Books are 4.25″ x 11″, 40 pages of information and poetry, with glossy covers featuring “Dusk in the Woods” and little thumbnails of all four pieces in “Art of the Watershed”. $8.00 each plus $2.50 shipping (they are oversized for mailing first class). You can order one on my poetry page, or in my Marketplace. My biggest inspiration for poetry, prose and artwork is the world right around me, and I enjoy the opportunity to share it from the perspective of one who walks and hikes and bikes and carries a camera, art materials and journal everywhere—even around the house—so the inspirations are fresh. In December, 2006, two of my poems were chosen to be published on a section of the Prairie Home Companion website entitled “Stories From Home/First Person” for submissions of writing about the place we feel most familiar. I’m a long-time listener to PHC and reader of Garrison Keillor’s books as well as a daily listener to The Writer’s Almanac featuring news about writers and writing and of interest to writers as well as a poem, all compiled and read by Keillor himself. I was astonished to find my poems were among the first chosen from apparently thousands, and so happy to be able to share them with a potential audience of so many similarly inclined writers and readers. My poetry readings and art exhibits were the vision of Maggie Forbes, executive director of the Andrew Carnegie Free Library & Music Hall, after learning of my publishing of those two poems. I owe her many thanks for encouraging me to present this combination of my visual and literary art, a first for me. I love that building, every inch of it, and the opportunity to bring people in to visit is an honor.